Sandwiched between Santa Monica and Malibu, the Pacific Palisades has long been a choice neighborhood in which to live. 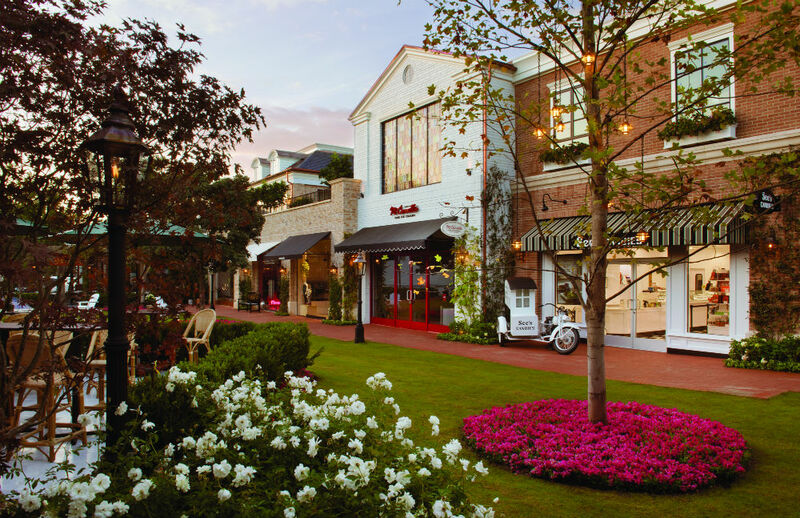 Now, thanks to the opening of Caruso’s Palisades Village this fall, it’s a shopping mecca, too. Among the 125,000-square-foot mixed-use development’s offerings are more than 40 specialty and boutique retailers, including many “firsts” for coveted, female-founded and, in many cases, locally grown brands. Stylist-turned-designer Andrea Lieberman, for example, chose Palisades Village for the first West Coast location of A.L.C., the contemporary ready-to-wear brand she launched in L.A. back in 2009. You’ll be wild about her animal-print separates and feminine yet modern dresses. Another brand with its first West Coast store in the Village is Botanica Bazaar, Bethany Mayer and Leilani Bishop’s Amagansett, N.Y.-based natural-beauty and wellness apothecary. Vintner’s Daughter and the Beauty Chef are just two of the clean, cult-favorite product lines carried. Shoppers can peruse more than 100 athleisure designers (e.g., Cushnie and Blanc Noir) and self-branded collections at the first permanent brick-and-mortar location from Carbon38, an L.A.-based luxury activewear and lifestyle brand founded by two former ballerinas. The store also hosts weekly fitness classes where you can put those Carbon38 Takara leggings to the test. The first-ever boutique from renowned L.A.-born-and-raised jewelry maker Jennifer Meyer is here, too. Diamond-dotted Good Luck charms, opal-inlay heart necklaces, modern tennis necklaces and more (including limited-edition store exclusives) sparkle against a blush backdrop. Steps away, stop by the first brick-and-mortar shop from Rachel Zoe. The stylist, designer and television personality’s namesake clothing collection, vintage pieces and more await, as do Zoe-trained stylists who will help you put it all together. Killer shoes are essential to any outfit, and L.A.-based Tamara Mellon delivers at her first permanent physical store, opening Dec. 8. According to the Jimmy Choo co-founder, her Italian-made footwear is designed for “leaning in, climbing ladders and shattering ceilings” (and looking fabulous, to boot). Mommies have diamonds and designer duds; babies and kids have premium ethically made, super soft and organic fashion basics from Mini Mioche. The Palisades Village location is the first in the U.S. for the Canadian company, founded by Alyssa Kerbel a decade ago. Home gets love in the Village, too. St. Frank, a buzzed-about luxury home decor store from San Francisco, has its—you guessed it—first permanent L.A. outpost here. Created by Christina Bryant, a 30-something Stanford MBA, St. Frank offers “sustainably sourced and produced home goods for the conscious millennial,” such as framed Senegalese textiles and handmade Juju hats. Oprah and Nate Berkus aren’t millennials, but they’re reportedly fans. Also mission-driven is The Little Market, the first physical store from the nonprofit founded by philanthropist, author and fashion designer Lauren Conrad and social-justice activist Hannah Skvarla. The fair-trade shop empowers female artisans worldwide by bringing their handmade goods to socially conscious customers. Among its stylish finds are handmade tassel earrings from Cambodia and candles created by refugees resettled in Massachusetts. You’ll also find Anine Bing, Cynthia Rowley, Paige, Towne by Elyse Walker, Serena & Lily, Zimmermann and several other female-powered boutiques in tony Palisades Village, plus similarly compelling dining and entertainment options. Together, they make this compact community gathering place a world-class destination.